A Microsoft representative brought an LG prototype phone running Windows Phone 7 Series to the Engadget Show earlier today. This is the first time Windows Phone 7 Series has officially been seen running on a branded phone. The prototype itself is a QWERTY slider- relatively thin but otherwise generic-looking. Detailed specs are unknown, but we’re told it’s likely powered by a Qualcomm Snapdragon chip. 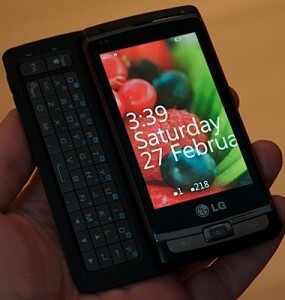 The phone has the required back, home, and search keys, along with buttons for camera, volume, and power. It has a 3.5mm audio jack and a 5.0 megapixel camera with flash. More photos here.